Agnus castus, also known as the ‘Chaste Tree’, is actually a shrub with lavender or violet flowers. Sometimes it is referred to as Abraham’s Balm, Monk’s Pepper or Chasteberry. The use of Agnus castus has been recorded since the time of Hippocrates. It was believed to be an anti-aphrodisiac and hence the names ‘Chaste Tree’ and ‘Monk’s Pepper’. 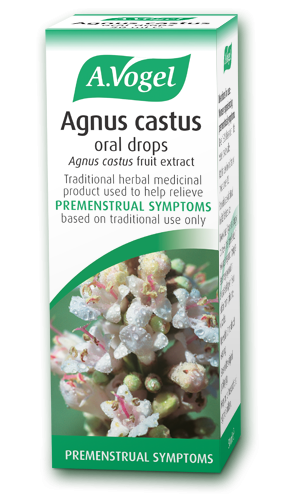 Nowadays Agnus castus is recognised more for its ability to help maintain the normal balance of the female hormones in younger women. The berries are used in this tincture – these are reddish brown fruits which give off a pleasant peppermint-like smell. Another botanical name for Agnus castus is (confusingly) Vitex agnus castus and because of this, it is sometimes referred to simply as Vitex. The plant grows mainly in the Mediterranean, although it also thrives in sub-tropical regions such as in Africa and the USA. Agnus castus grows to a height of up to 5 metres and bears delicate leaves, flowering in late summer. Women experiencing premenstrual symptoms: 15 to 20 drops in a little water twice daily. Taking the maximum daily dose, you get 1,000 mg of Agnus castus extract, equivalent to 100mg dried berries.